IWAKI Nordic A/S offers a wide range of collection systems and other products that make handling of chemicals safer for both staff and surroundings. The range covers collection trays (mobile and with/and without lid), area protection, heating mats etc. 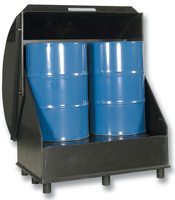 for containers, drums, IBC etc. The products are made of PE (polyethylene). PE is chosen for the UV resistance of the material as well as a combination of chemical resistance, strength and flexibility with respect to materials such as polypropylene (PP), fiberglass and stainless steel. Most of the products are ready for quick delivery from either the Nordic warehouse in Hillerød or the central warehouse in Germany. Call (+45) 4824 2345 for price and delivery time. The range of collection vessels and trays up to 225 liters includes almost 100 different models that vary in size and function. They all have a very good chemical resistance to a wide range of aggressive media and at the same time they have a good stability. 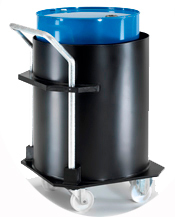 The range of collection vessels and trays up to 1000 liters includes over 30 different models that vary in size and function. There are solutions both with and without lid. 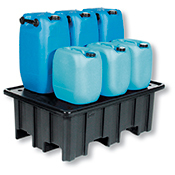 The collection vessels and trays are specially designed for IBC, and they have good chemical resistance and good stability. 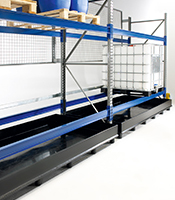 For rack systems we offer app. 50 approved collection solutions in standard sizes. The solutions can be supplied with perforated PE panel or grid. The safe internal transport of containers with aggressive liquids is no problem with our mobile systems! The mobile solutions are made in the same materials as our other collective solutions, and we combine the good resistance characteristics with mobility on wheels. With our KN-F surface protection we offer a flexible solution for the protection of areas where aggressive liquids are stored and drained. The range consists of a wide range of sizes that allow for maximum use of the available area. The range of accessories includes a variety of product types that make handling of chemicals more secure for both staff and surroundings. Eg. 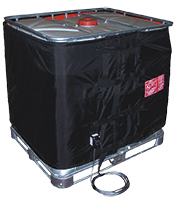 We offer heating jackets for both containers, drums and IBC. 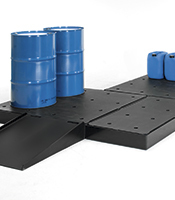 In addition, PE stackers and filler platforms for drums and IBC, etc.